A compact area of showers and storms continues west centered southeast of Jamaica. At this time it appears that only a mid level circuatlion is present. A "false eye" is present on the satellite image below. I will be watching for any surface pressure drop as a sign of a low level center forming. 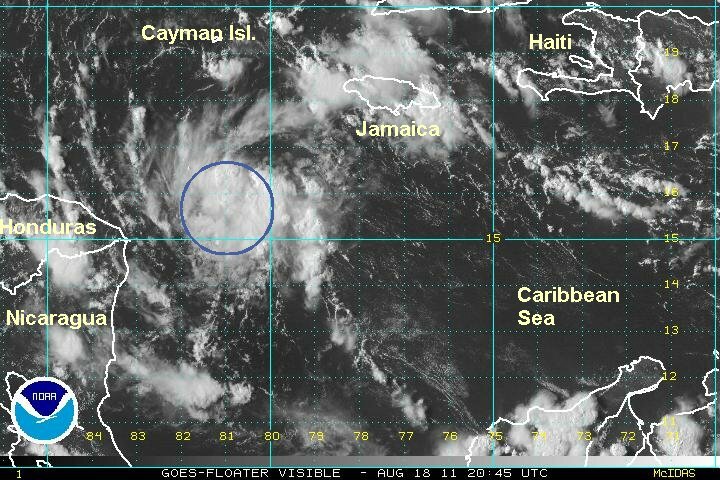 As of 12 pm edt / ast the tropical disturbance was centered near 15.5 N / 74.7 W or roughly 225 miles se of kingston, Jamaica. It is moving west at about 10-15 mph. Top sustained winds estimated at 20-25 mph. Pressure estimated at 1012 mb. Forecasts take this low toward Nicaragua and Honduras over the next few days. There is potential for some strengthening before reaching land. 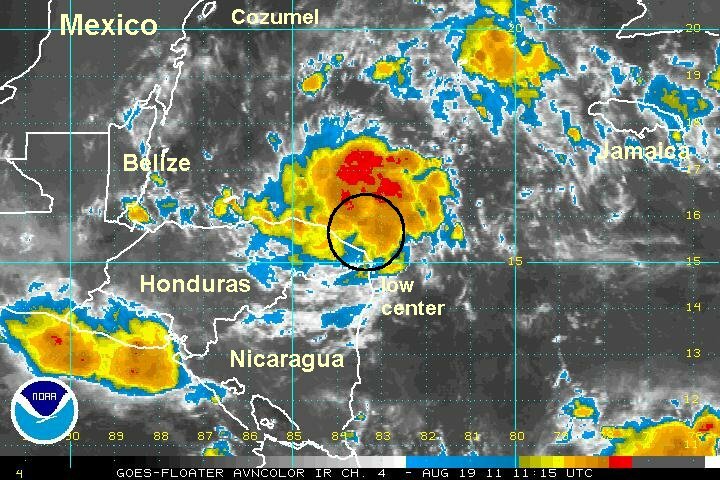 Regardless if the disturbance becomes classified, heavy showers and storms will affect northern Nicaragua, Honduras and Belize over the next few days. Surface pressure has been dropping slightly and convection concentrated near the center of this disturbed area of weather. 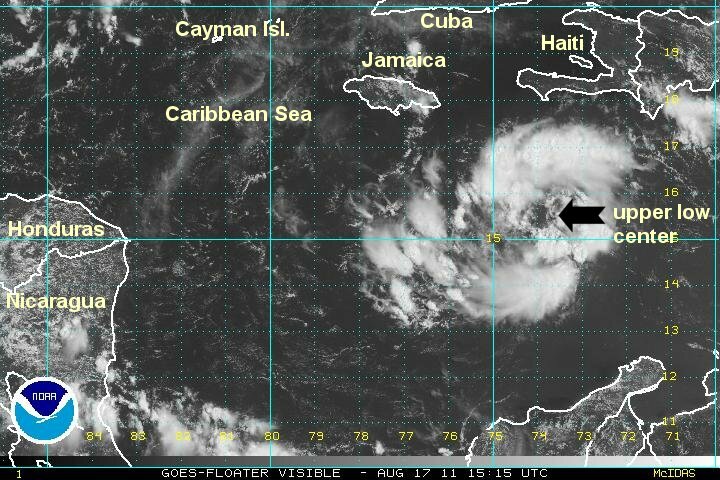 It appears that there will be enough of a surface circulation to classify this as a tropical depression this afternoon. As of 9 am edt the tropical disturbance was centered near 16.0 N / 79.3 W or roughly 350 miles from the northern coast of Honduras. It is moving just north of due west at about 15 mph. Top sustained winds estimated at 25 mph. Pressure estimated at 1011 mb. Forecasts take this low just north of due west into Central America this weekend. 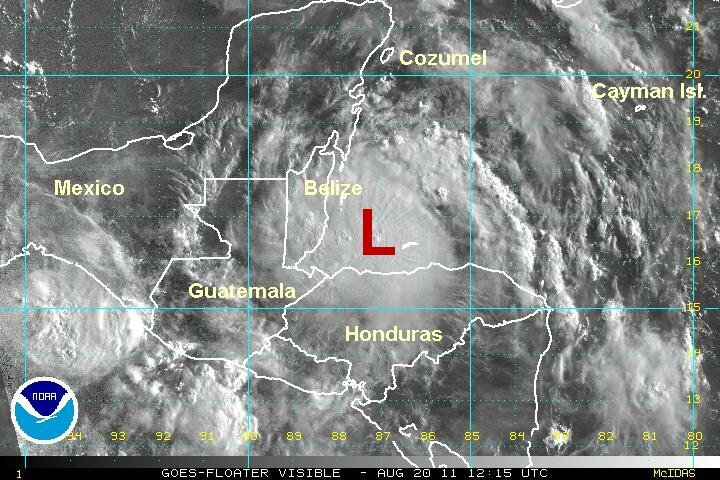 The areas affected will be Honduras, Belize and the southern Yucatan of Mexico. The greatest impact will be locally heavy rainfall unless the tropical cyclone develops significantly. It appears that a new tropical depression has formed in the western Caribbean this afternoon. 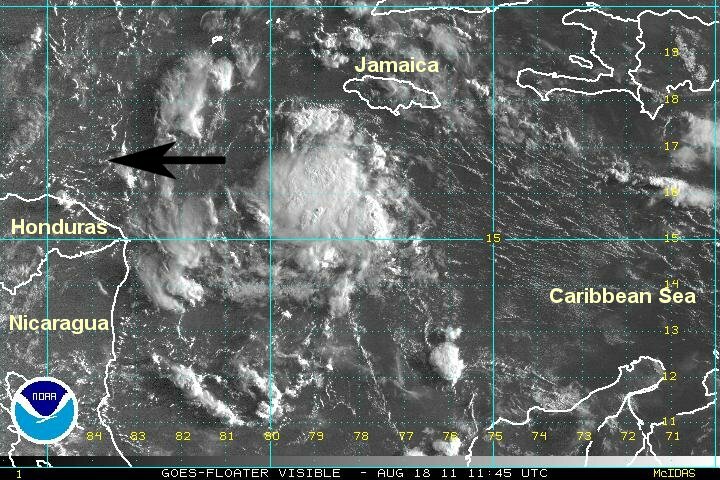 NHC did not classify as the hurricane hunter had mechanical problems and could not sample the 'disturbance" today. It still appears to me that there is enough convection and low level circulation to classify. My estimate at 16 north was a little far north this morning based on IR satellite imagery. Visible satellite shows the low center a little farther south. This is very significant since the low may move inland much earlier into northern Honduras which would curtail any further strengthening. 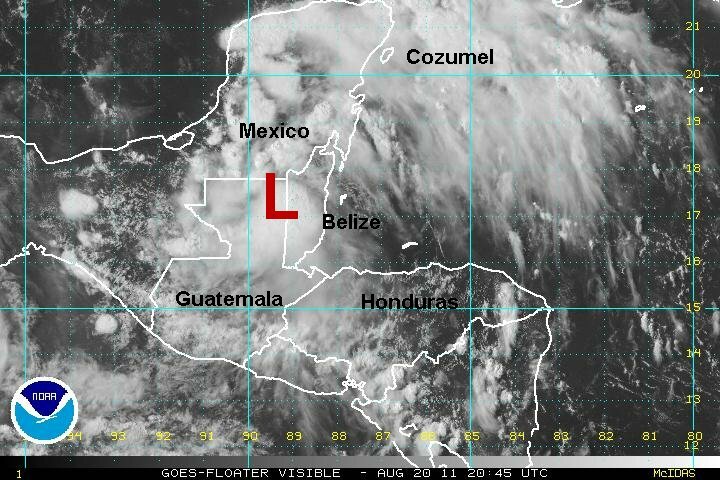 If the low center can stay just north of Honduras it still can become a tropical storm before moving into Belize. Heavy rain remains the may concern at this time. As of 5pm edt the unofficial tropical depression was centered near 15.7 N / 81.0 W or roughly 225 miles from the northeastern coast of Honduras. It is moving just north of due west at about 12 mph. Top sustained winds estimated at 30 mph. Pressure estimated at 1010 mb. 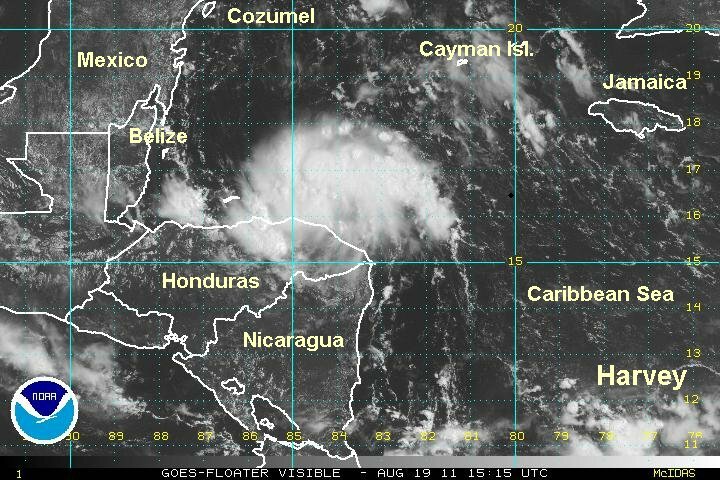 Tropical depression 8 is very close to the coast of Honduras. This proximity to land will inhibit any significant strengthening as it moves into Belize Saturday. It is likely that it will be a tropical storm as landfall occurs. The hurricane center's forecast track is interesting since it actually has (Harvery) inland in Honduras and developing into a tropical storm. This is extremely rare for a tropical cyclone to do this. Much of the circulation is over water where it will still be able to derive energy to strengthen some. As of 8 am edt the TD 8 was centered near 15.6 N / 83.7 W or roughly 55 miles nw of the Nicaragua / Honduras bordar. It is moving just north of due west at about 12 mph. Top sustained winds estimated at 35 mph. Pressure estimated at 1006 mb. Forecasts take this low west along the coast of Honduras and into Belize Saturday. Heavy rainfall is the main threat. This morning's recon recently found a pressure of 1004 mb and confirmed the 35 mph surface wind. Deep convection continues to build around the center of circulation and TD 8 should be classified as tropical storm Harvey very soon. I believe that there is enough evidence to upgrade now. Harvey will bring heavy rainfall in excess of 5" to the impact area and tropical storm winds. As of 1 pm edt (unofficial) tropical storm Harvey was centered near 16.3 N / 84.5 W or 125 miles east of Roatan, Honduras and 265 miles ese of Belize City, Belize. It is moving just north of due west at about 10 mph. Top sustained winds estimated at 40 mph. Pressure estimated at 1005 mb. Forecasts take this low west just north of the coast of Honduras and into Belize Saturday. Heavy rainfall is the main threat with tropical storm winds. Harvey will make landfall in southern Belize around midday. Heavy rainfall with tropical storm force winds can be expected. Rainfall totals in excess of 5" can be expected. Gradual improvement can be expected over the Bay Islands today as the low center continues west. As of 9 am edt tropical storm Harvey was centered near 16.6 N / 87.5 W or about 50 miles east of the southern coast of Belize. It is moving west at about 12 mph. Top sustained winds estimated at 60 mph (NHC 60 mph). Pressure estimated at 994 mb. Harvey made landfall as expected near midday on the southern coast of Belize. I believe that Harvey is no longer a tropical storms as winds most likely aren't sustained at 40 mph any longer. NHC is still estimating 50 mph. As of 5 pm edt tropical storm Harvey was centered near 17.2 N / 88.8 W or in extreme nw Guatemala. It is moving wnw at about 13 mph. Top sustained winds estimated at 35 mph (NHC 50 mph). Pressure estimated at 998 mb.